A few weeks ago, my family rented a condo in San Diego for a few days of fun at the beach. Too bad we didn’t check the weather before we left… we got caught in “June gloom.” An ever-present layer of fog hung low over the coastline, casting a chill everywhere we went. Even though the weather was less than ideal, we made the best of things, bundling up in sweatshirts and checking out the local sites and restaurants. We had Father’s Day dinner at the Hotel del Coronado, a beautiful historic hotel on the island of Coronado off the coast of San Diego. My husband’s nickname is “Abba” in our home, so we celebrated Abba’s Day with a delicious seaside meal. We ordered a few appetizers, including their signature warm goat cheese spread. Goat cheese, pesto, sun dried tomatoes and roasted garlic are baked together into a warm, gooey spread. It’s served with crusty, freshly baked bread for dipping. All I can say is, YUM. I could have made a meal out of the appetizer, it was that good. When I got home, I started thinking about that warm goat cheese spread. I wanted to recapture the flavor of the appetizer in a vegetarian entree. For a few months, I’ve been thinking about developing a stuffed tomato recipe for summer. I decided to combine the goat cheese and pesto flavors with quinoa and tomato to create a mouthwatering, gluten free vegetarian entree. 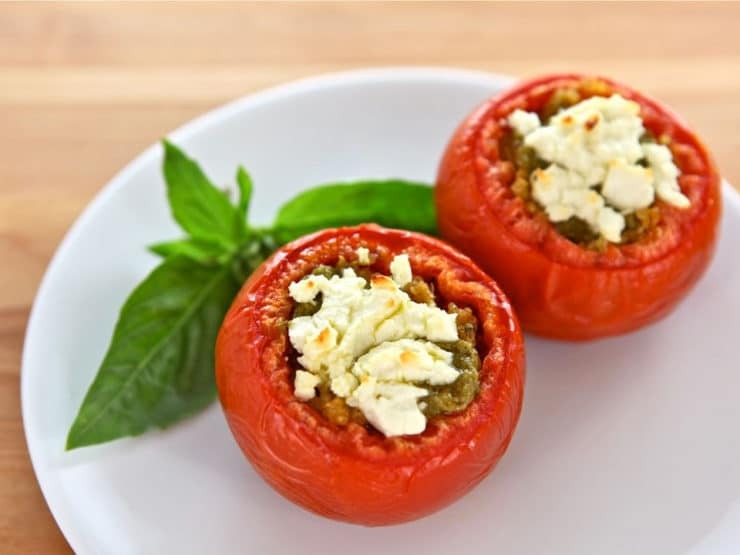 I’ve tried many stuffed tomato recipes in the past, but none of them have really knocked my socks off. Many of the stuffing mixtures seem bland and turn out somewhat dry after baking. Also, I hate throwing away the inner seeds and gel of the fruit. It seems a waste, but most recipes don’t call for including the seeds in the stuffing. 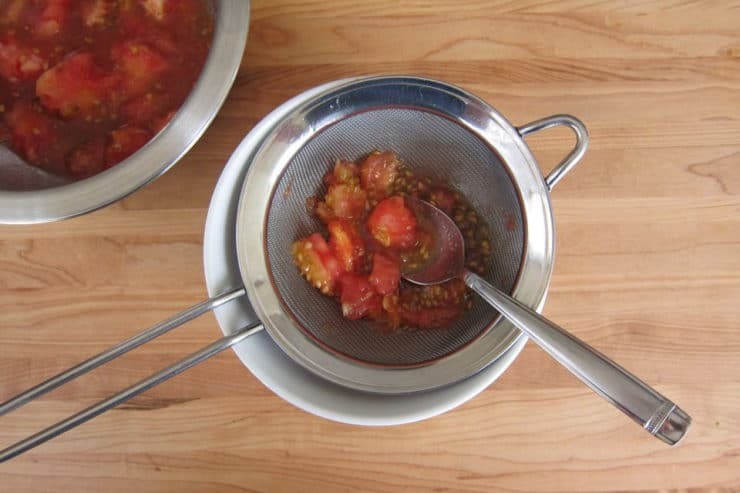 I solved the problem in my recipe by using a wire mesh sieve and spoon to extract the flavorful juicy liquid from the tomato seeds. 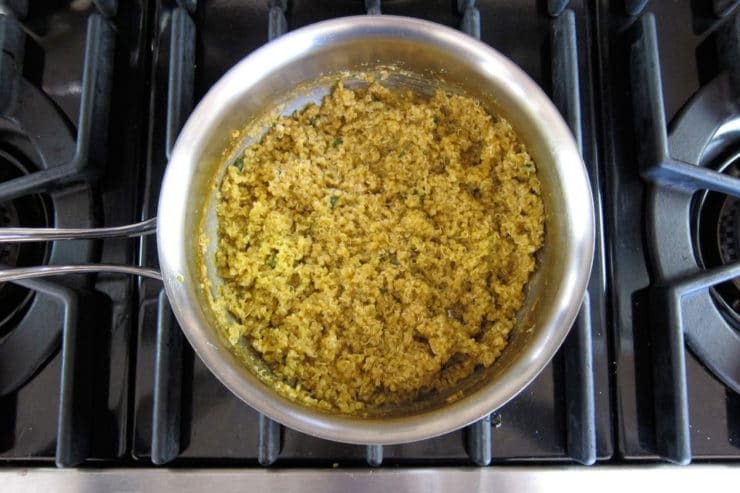 I used that liquid to cook the quinoa, along with crushed garlic, which infused it with a wonderful flavor. After that, I mixed the cooked quinoa with fresh basil, pesto and parmesan, which made it moist and gave it a terrific herby, cheesy flavor. 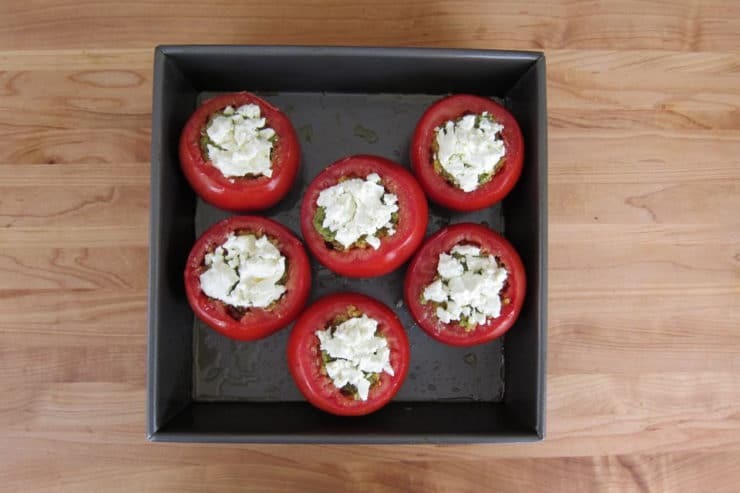 I topped each tomato with a dollop of pesto and a tablespoon of goat cheese. The tomatoes baked up to warm, gooey perfection– a perfectly satisfying meal when paired with a side salad. You can use pesto from a jar, or make it fresh using one of my homemade pesto recipes. Those of you who are gluten free should probably make your pesto from scratch, unless you can find a jarred version that is certified GF. If you’re a vegetarian, make sure your parmesan is made with a vegetarian rennet (if using a jar of pesto, check the ingredients there too). Enjoy! Slice the very tops of the tomatoes off (where the stems are) and remove the caps. 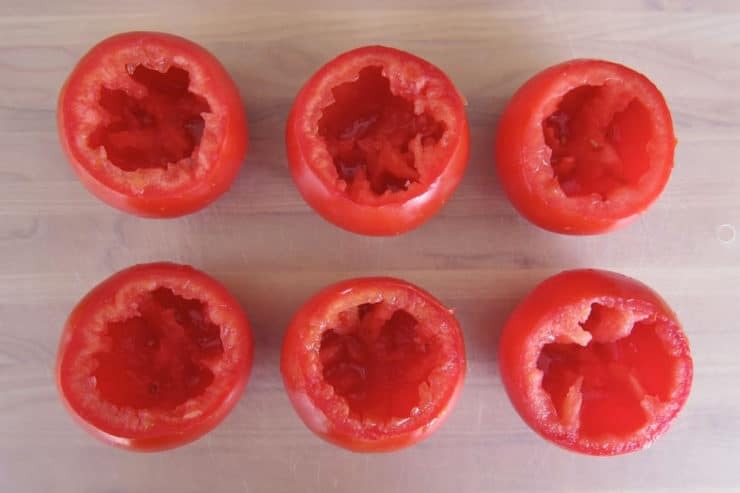 Use a knife to cut around the inside and remove the inner core and seeds from the tomatoes, leaving the walls intact. 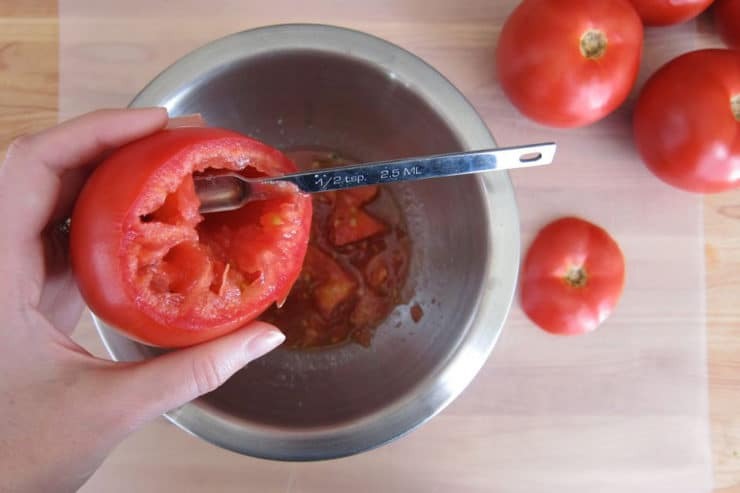 Scoop any remaining seeds out of the tomatoes with a small spoon (I use a metal 1/2 teaspoon). Pour all of the gel, seeds, and pulp into a medium bowl. Use a spoon to push the gel, seeds, and pulp through the wire mesh sieve, releasing their juice into another bowl. 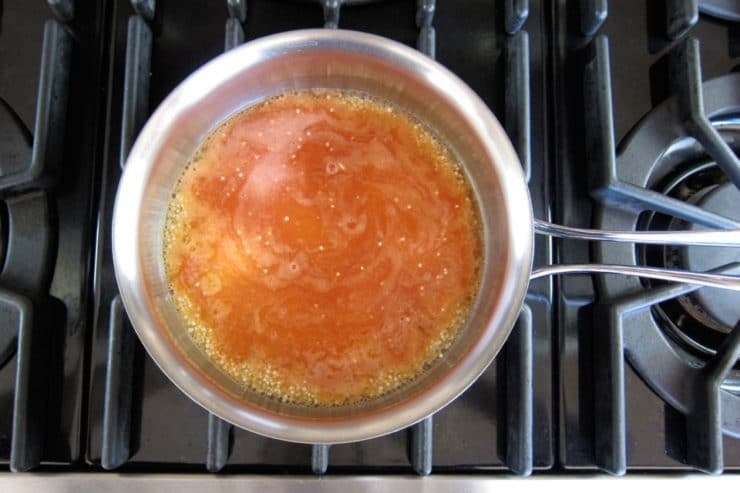 Press down on the solid ingredients and agitate the mixture to extract as much juice as possible. You will need to do this in batches; when one batch is juiced, scoop the solids into the trash and start on the next batch. 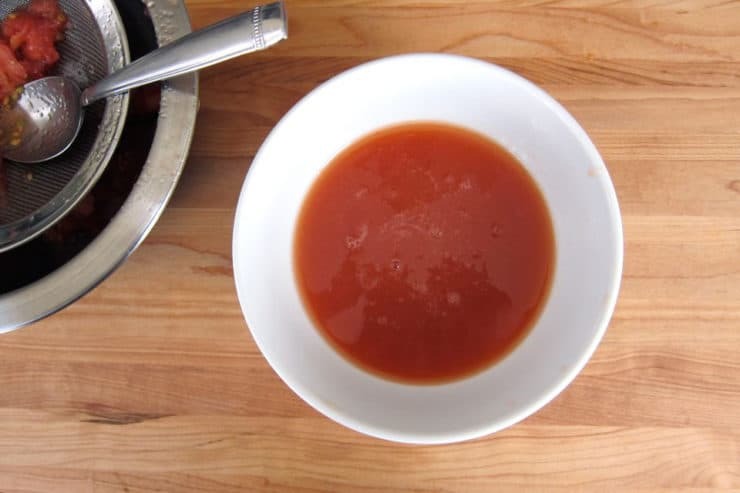 Pour the tomato juice into a measuring cup. You will need 1 cup of liquid total. If the tomato juice does not make a full cup, top it off with water. 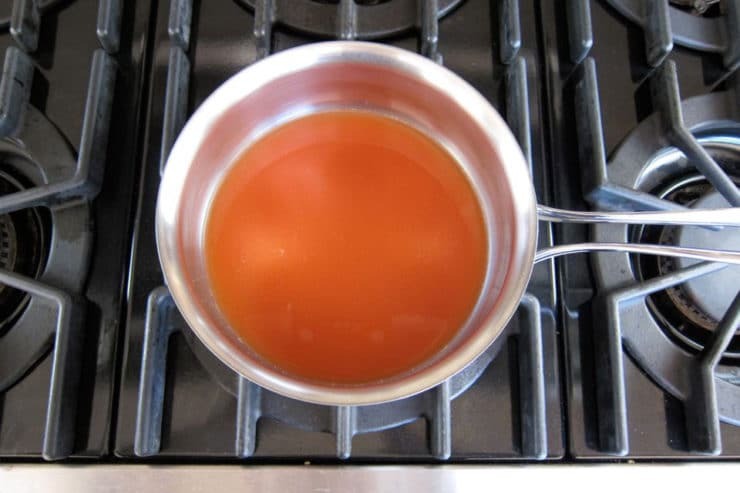 Pour the juice (and water, if you added any) into a small saucepan. Rinse the tomato pulp out of the mesh sieve. 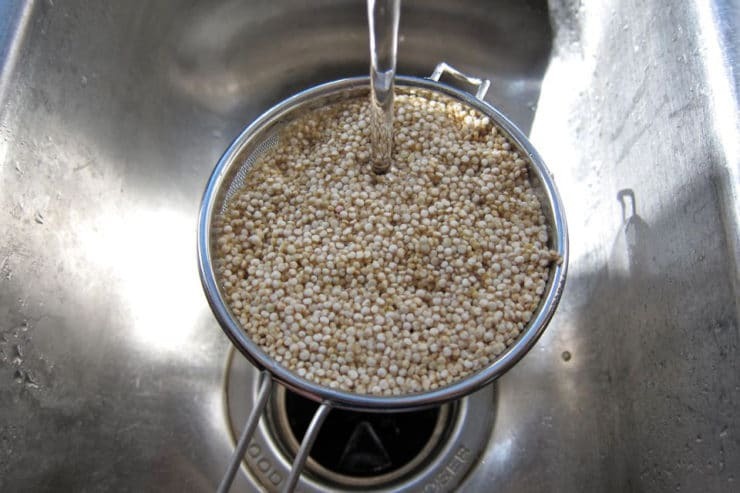 Pour the dry quinoa into the sieve and rinse it with cold water for a few minutes. Drain. 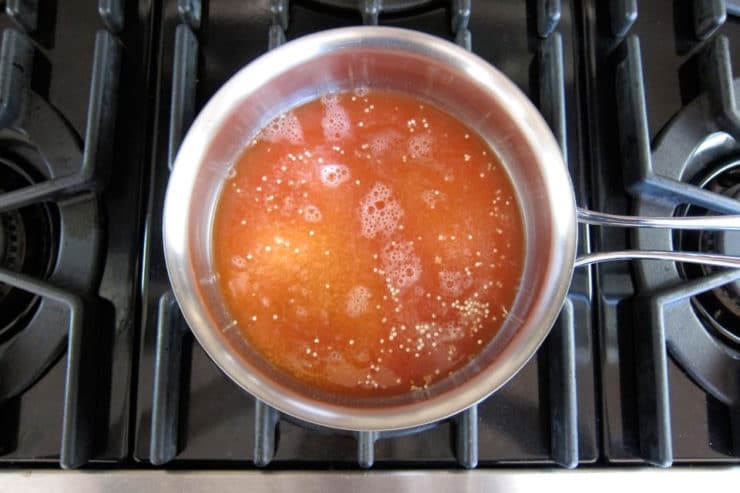 Pour the quinoa into the saucepan with the tomato liquid. Add the crushed garlic to the pan. Bring all ingredients to a boil. Reduce heat to a low simmer and cover the pan. 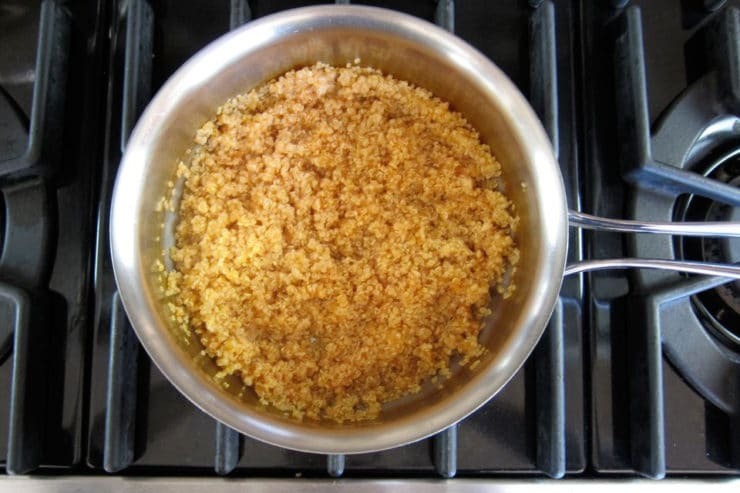 Simmer the ingredients for about 20 minutes till all of the liquid is absorbed and the quinoa is tender. Meanwhile, preheat oven to 400 degrees F.
While quinoa is cooking, grease the bottom and edges of your cooking pan or dish with olive oil. 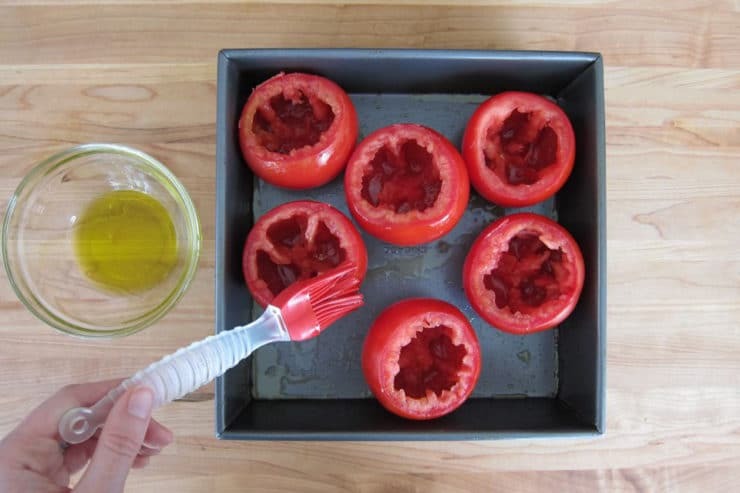 Lightly brush the outside of each tomato with olive oil and place them into the baking dish. When quinoa is finished cooking, remove the lid and fluff it with a fork.Use the fork to stir in 2 tbsp of pesto along with the grated parmesan and fresh basil. Season the quinoa with salt and pepper to taste. Use the fork to stir in 2 tbsp of pesto along with the grated parmesan and fresh basil. Season the quinoa with salt and pepper to taste. Divide the quinoa evenly between the six tomatoes, stuffing each one loosely with the mixture. then top each portion of pesto with 1 tbsp of goat cheese. 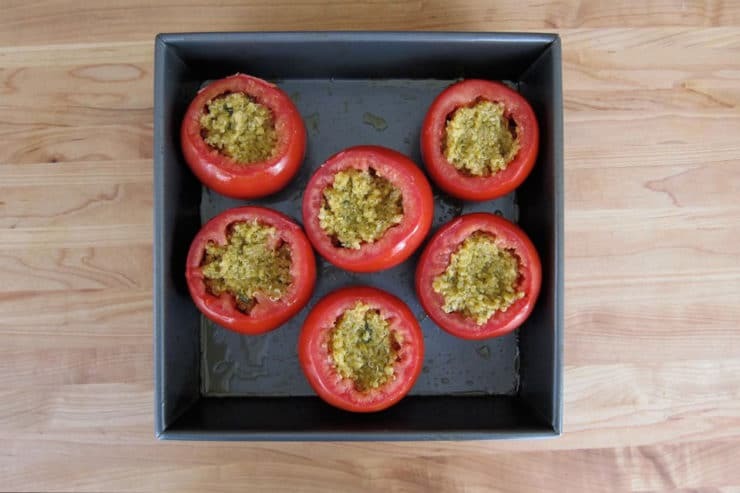 Place the tomatoes into preheated oven. Let them cook for 20-25 minutes till the tomatoes are tender and the goat cheese starts to brown at the tips. Serve hot. Garnish with fresh basil leaves, if desired. Fabulous recipe! I only had 2 tomatoes so I filled the rest in a pre dated large red bell pepper that I roasted in oven for about 15 minutes with just a little olive oil cut in half open side down . Delicious. This one of my favorite recipes of all time… I have made it numerous times. It is a lot of work but well worth it! I prefer red quinoa instead of white. You will have to cook it longer and add more tomato juice… It will be a little more grainy… More of a bird seed texture. I prefer that to the white. My big tip on this recipe is to use a grapefruit spoon to clean out the tomatoes! Works fabulously! 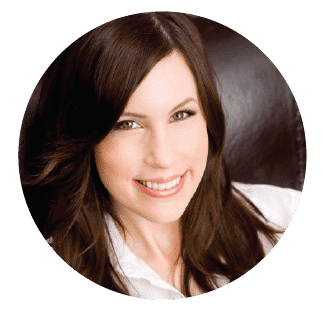 Thank you so much for this healthy amazing recipe! Hi Tori! I absolutely love you and your recipes. I’ve made this one before and it was a huge hit. Quick question: if I make too many, can leftovers be reheated? Or are they good served cold? Thanks so much! Hi Michelle, sorry it took me so long to respond. They can definitely be reheated in a 325 oven for 15-20 minutes till warmed through, though they may become a bit more delicate after reheating. 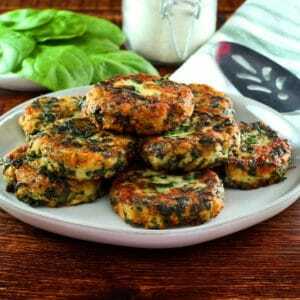 You can also reheat them in the microwave on 50% power for a few minutes till warmed through. I loved this recipe! It was a huge hit with my family. However, I had a bit of a problem with the tomatoes. They sort of collapsed as soon as I tried to move them onto the plates. Did I do something wrong, or is that normal? Hi Annelisa! I’m so happy you enjoyed the recipe. I think it depends on the type of tomatoes you get from the store. 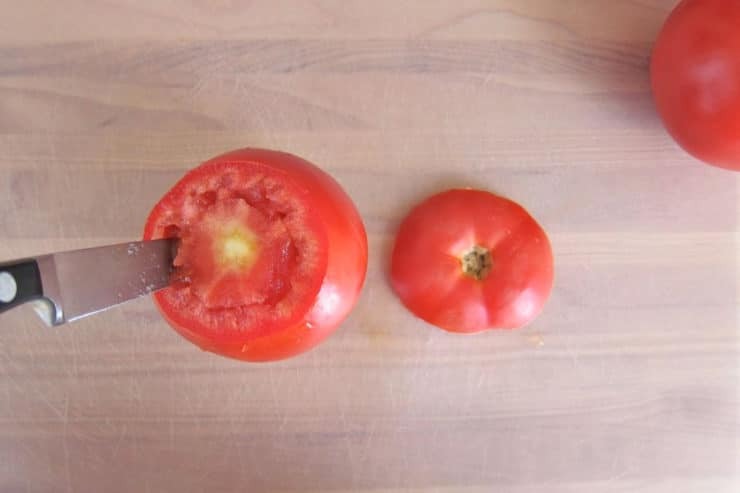 Some tomatoes have a thinner outer wall, while others are more sturdy. 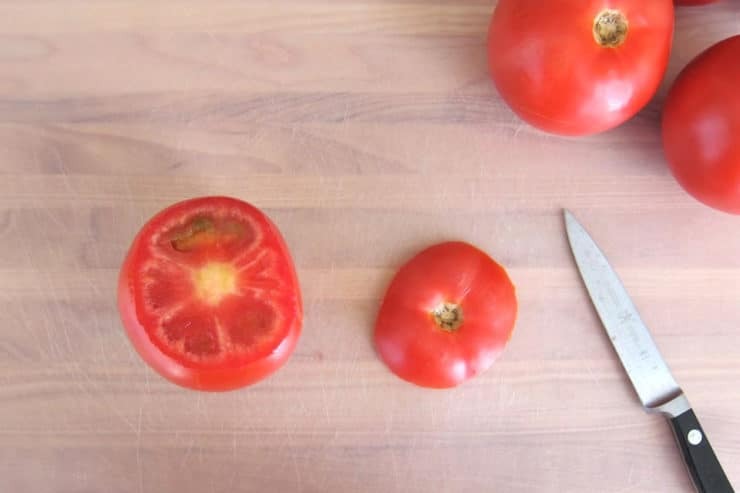 Beefsteaks are the strongest, but they sometimes lack flavor (especially at this time of year). Vine-ripened tomatoes tend to be more delicate (but are more flavorful– especially the organic ones). Next time you can try cutting the baking time by 5-10 minutes. 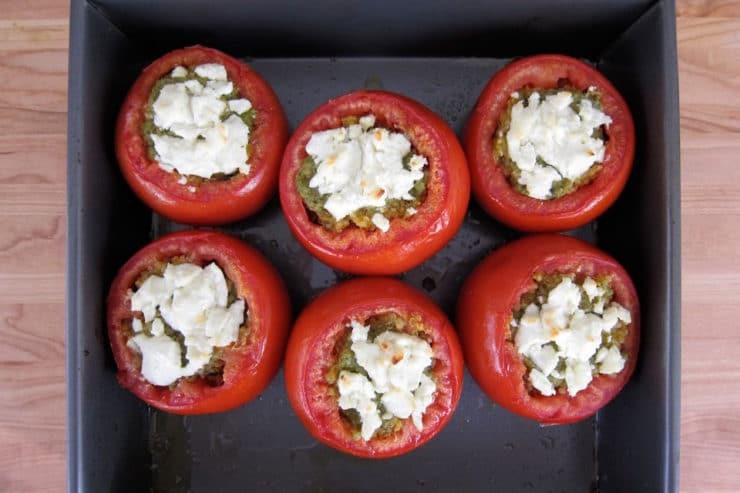 Since the filling is basically cooked already, the baking simply allows the flavors to blend and the cheese to melt into the quinoa, so cutting the cook time a bit won’t hurt the tomatoes. 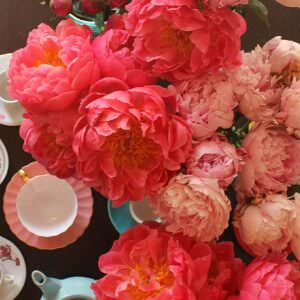 They should be tender, but they shouldn’t collapse. What kind of quinoa do you typically use for this recipe? I see all different varieties at the store now and it gets me confused! Hi Hannah! Regular white quinoa will work best for this recipe. 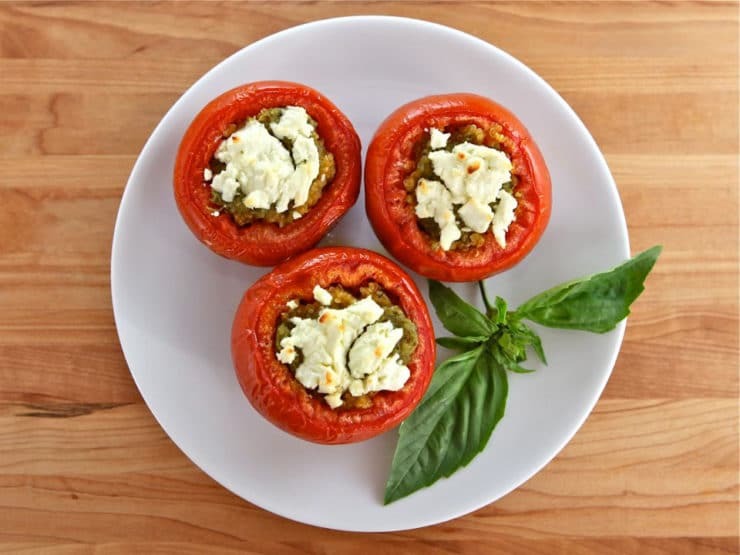 Red and black will give a different flavor; the white is softer and has a more neutral flavor, which allows it to soak in the pesto and tomato flavors better than the other varieties. The red quinoa is more solid and better to suited to salads, while the black has a slightly sweeter and more distinct flavor. Don’t forget to rinse the quinoa before cooking. Enjoy! 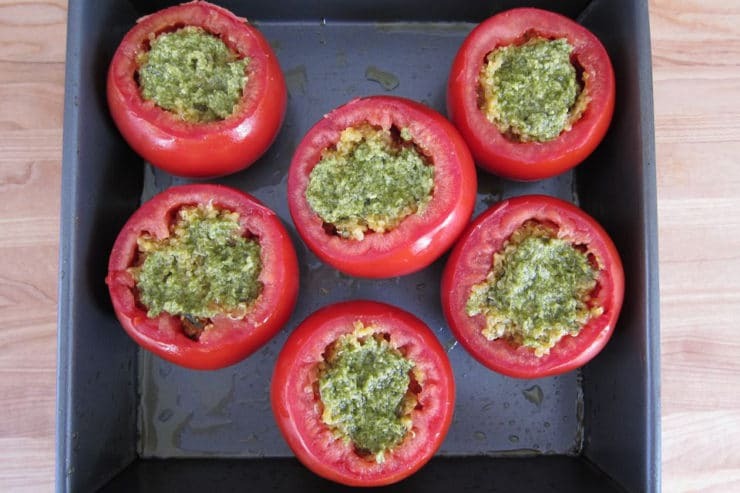 Wondering if you can make these ahead of time and pop them in oven before serving? I made these last night and loved them. I had a bit of a problem in that 2 of the tomatoes split as I tried to serve them, so they didn’t look very nice, but they tasted great. How to make home made nachoes? We went to San Diego for the last part of our honeymoon last August- there’s a great little Italian place in the gaslamp district- OperaCaffe- that ranked up there with James Beard winner prepared meals we had on other legs of the trip. As soon as the tomatoes ripen this is dinner!! It would be great for Sukkot, too! San Diego is a great city! Being a South Florida girl, I’m pretty sure I wouldn’t be getting in the chilly Pacific water. Aside from that…(I don’t have a segway) Most stuffed tomatoes are raw, roasting the tomatoes gives them an added sweetness, sound great! Can’t wait to try it! Looks great, and love the use of quinoa as the stuffing.